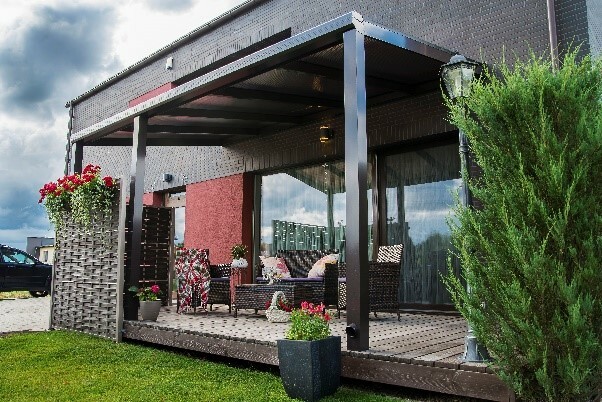 For those who want to spend more time close to nature at their house terrace, an irreplaceable product - an aluminum roof construction with glass or polycarbonate roof, with fixed or sliding/folding aluminum doors. 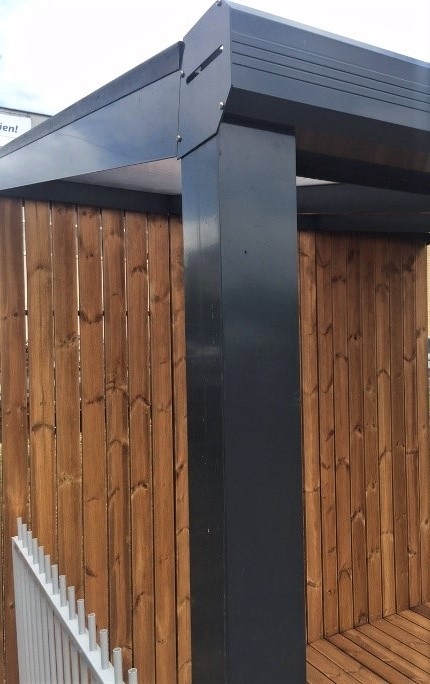 You can also choose a shed which protects against rain in the absence of strong wind. However, it is worth mentioning, that it is extremely popular to close the aluminum roof construction with widely spaced doors. Normally, fully glazed winter garden is being used by customers all year round. During the cold season, electric or UV heaters are installed, which allow to enjoy nature and to extend the terrace season. The shed is popular not only for terraces, but also as a roof for car's parking place or to keep farm objects under. It looks aesthetic and protects against bad weather. Sheds for cars or terraces are made individually, but the most popular is to choose from standard dimensions. The main components for the roof are aluminum profiles, special gaskets, as well as glass or polycarbonate fillings for the roof. 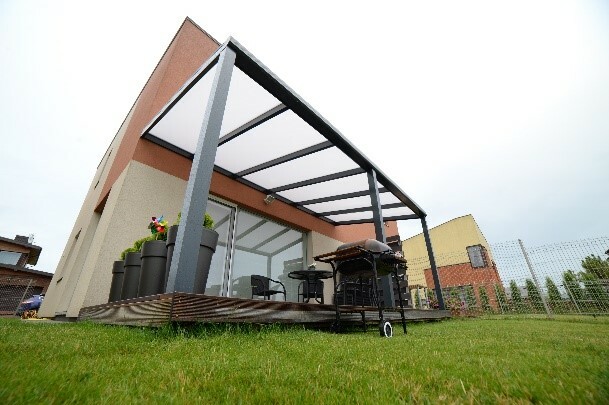 Also, if the roof is closed, the front and sides are most popular to fill with lightweight aluminum construction sliding systems. PROFILES. If you have chosen the painted aluminum, you do not have to think about repainting and it will be easy to maintain it. The rain gutters are integrated into the upper profile and aluminum columns. When the roof is being assembled, in the upper corner, due to need, it is necessary to drill a hole for the water to run out, as well as to drill a hole at the bottom of the column for rain drainage. The column hides a rain pipe with joints, which is assembled together with a shed. A standard 11-degree roof slope for all roofs. 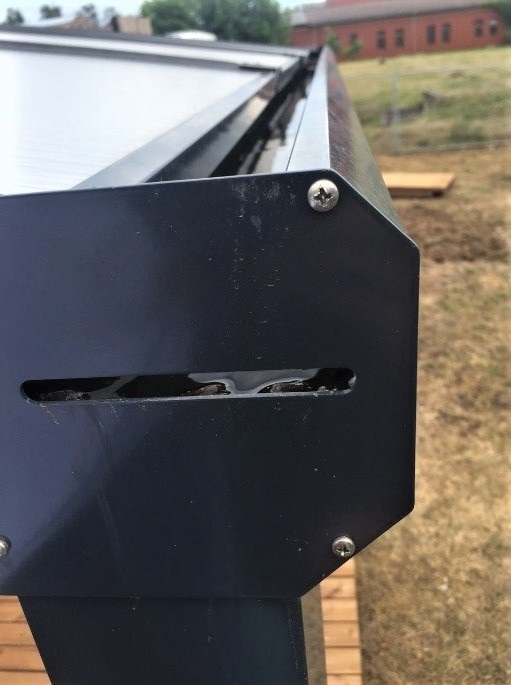 For the roof construction, we use an amplified multi-chamber profile for the front gutter, which is not only much more stable, but also excellently hides the fastening screws in one of the chambers. It is recommended to concrete the front columns-beams or to build on concrete-poles. It is also possible to assemble directly on the terrace, but it is recommended to select carefully the front columns' place for mounting. It is important to have a stronger construction under the terrace's boards and to avoid even minimal movements. ROOFING. Our proposed roof can be either covered with 8 mm safety glass or with 16 mm polycarbonate. Glass or polycarbonate sheets are laid on special gaskets and the joints are pressed with a clamping aluminum profile. When choosing glass, customers can choose from a clear, tinted, hardened or laminated + hardened. When choosing polycarbonate, we offer a 16 mm thick, UV-resistant product. You can choose this cover, the same as glass, in transparent, tinted or white (matte/frosted). We offer four most popular roof depths and their different widths. The individual projects are also possible, which we could calculate according to the technical drawings provided by customer. When ordering from us, You will not only receive production in time, but we will also give an advice, will pack goods safely and will add a detailed installation guide.